In recent weeks, Sweden has seen a dramatic surge of anti-Semitism, including immigrants pledging to kill Jews and a series of attacks against Jewish venues. However, the rising hatred of Jews among the burgeoning Muslim diaspora remains a problem the Swedish authorities remain reluctant to admit, let alone address. Historically, anti-Semitism in Sweden was mainly professed by right-wing extremists. The recent years, however, marked a paradigm shift, revealing a surging hatred of Jews among the nation's growing Muslim diaspora. 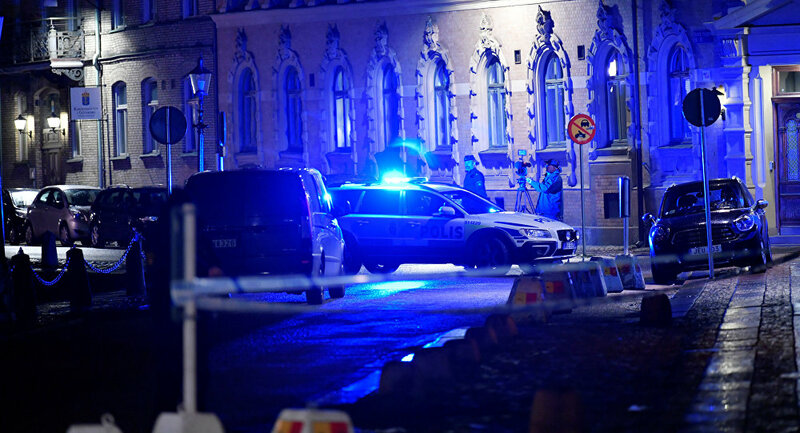 Last week alone, two newly arrived immigrants of Syrian and Palestinian origin were arrested for a bomb attack against a synagogue in Sweden's second largest city of Gothenburg. Christian Democrats Ebba Busch Thor and Andreas Carlson stressed that hatred of Jews occurs to a much greater extent among people with roots in the Middle East and Northern Africa. "For those seeking shelter in Sweden it is completely unacceptable to continue to live out the conflicts they had in their homelands," they wrote in an opinion piece in the Svenska Dagbladet daily, urging for protection of Sweden's Jews. Historian Henrik Bachner argued that anti-Semitism has for a long time been a blind spot in Swedish research. Nevertheless, surveys carried out by the Living History Forum among both adults and students have highlighted the prevalence of anti-Semitic attitudes among Swedish Muslims, compared with the rest of the population. For instance, only 18 percent of upper secondary school students were found to have a consistently negative attitude toward Jews. Among the students who identify as Muslims, however, the figure was 55 percent, the Aftonbladet daily reported. A 2016 study attributed only 5 percent of anti-Semitic incidents in the Nordic country to right-wingers, as opposed to 51 percent attributed to Muslim extremists. "Anti-Semitic outbreaks usually occur in connection with unrest in Israel and Palestine. This summer, an imam in Helsinborg said that Jews were 'offspring of monkeys and pigs,' a recurrent motif in Islamic anti-Semitic propaganda," Henrik Bachner reminded. While Swedish politicians have no qualms about condemning anti-Semitism on the far-right political spectrum, there is a marked hesitation to speak out against hate crimes committed by other minority groups. ​In a recent interview with the Jewish Chronicle the Swedish prime minister, who recently condemned all forms of anti-Semitism, concluded that Muslims themselves were a vulnerable group. At the same time, he expressed concern about the rising hatred of Jews from the "new arrivals" from the Middle East, arguing it went against the moral fiber of Sweden. "Many have long been unable to realize that anti-Semitism can exist in groups that are themselves vulnerable and need help. But we must be able to call a spade a spade," the Swedish Liberal Party tweeted — reluctant, however, to elaborate on the matter, which is rather delicate for the country that prides itself on welcoming minorities and immigrants. ​"The Jews in Sweden are currently the canary bird in the mine, they are a litmus test as to whether Sweden can act as a multicultural country. For the greatest threat to the Swedish Jews is not the hateful Nazis (ever present as they are) but those belonging to other minority groups in the country who have immigrated with their hatred against Jews," columnist Adam Cwejman wrote in the Göteborgs-Posten daily, venturing that the Jewish diaspora might disappear altogether, unlike racism and hate. ​Sweden's Jewish population is estimated at 20,000. The extent of the Muslim diaspora is debated, as no religious profiling is permitted. However it was estimated at about 500,000 in 2009 and has grown considerably in recent years due to an influx of people from the Middle East. On Tuesday, an 18-year-old man held for allegedly throwing firebombs at a synagogue in the Swedish city of Gothenburg was released, despite remaining a suspect. According to the prosecution, there was not sufficient evidence to keep the man jailed. Swedish Jew Katarina Janouch reports she has had 2 sabotage against her car in short time. Her tyres were slashed today.